Welcome to Colossorama! A place built for the most violent people! 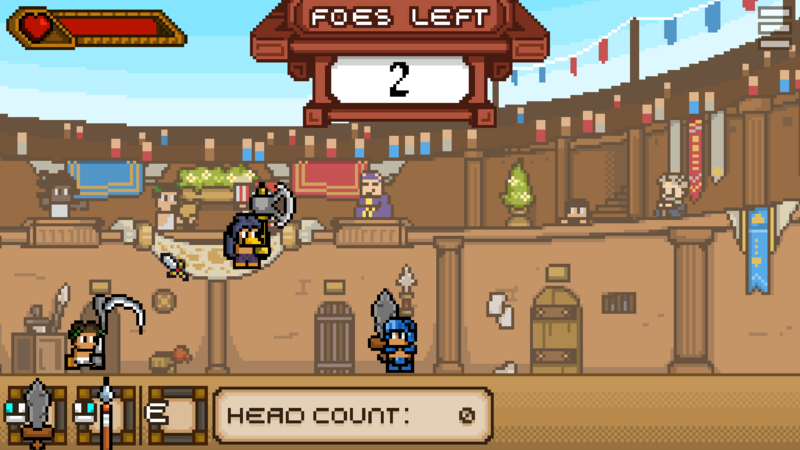 Pick a sword, ditch it for a spear, swap it for a hammer, take a drink or two, and get slashing and bashing! Only those that can adapt will be remembered in the Pantheon of Gladiators! So, get in there and make us proud. After all, heads won’t chop themselves, you know. 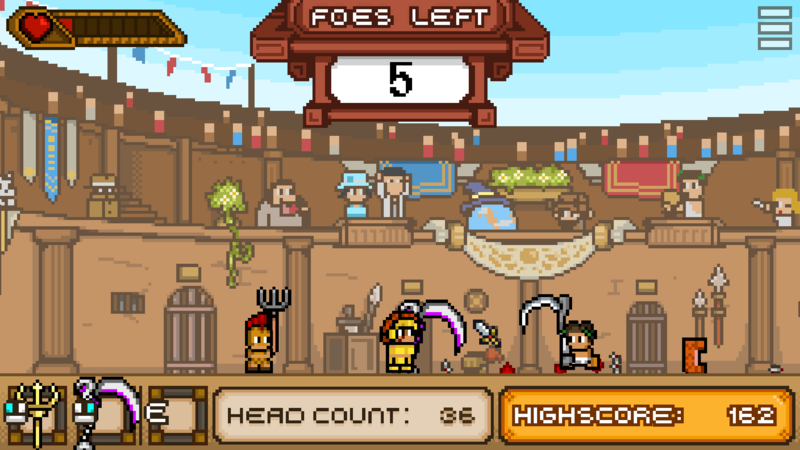 After surviving a wave of enemies, select a new Weapon or Item, and fight another round! But you can only carry so much with you, so keep swapping until you get the weapons you like the most! 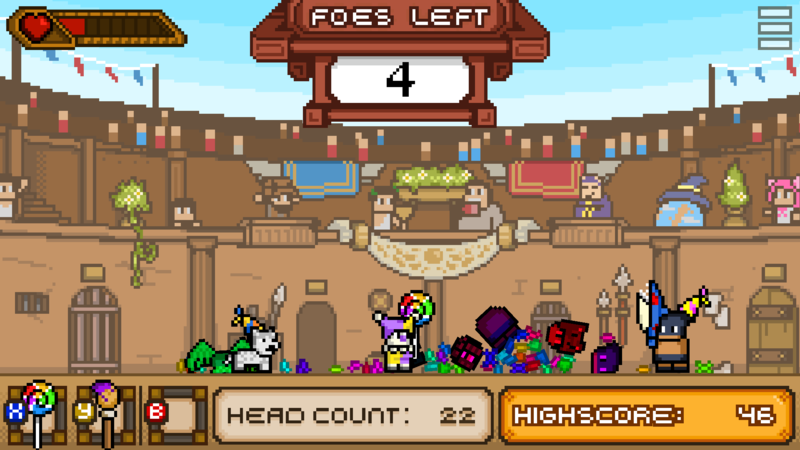 There used to be about 28 weapons and items to choose from. There’s over 60 now! Will you choose ranged over knockback? Healing over speed? Status effects over damage? Keep adapting to keep surviving! 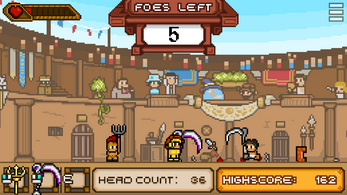 Swords, spears, axes, hammers, scythes, staves and many more! There’s poison, freezing, stunning, invincibility, projectiles, and more variables as well! You may fight in Colossorama mode for the core head-slashing experience, or choose from one of many challenges! 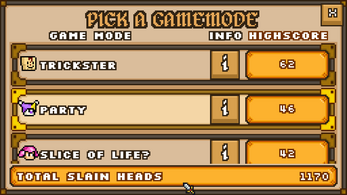 There’s fast paced combat, moon gravity, powerful enemies only and even a party mode for good measure! 18 playable characters for Colossorama mode, each with their own starting loadout! Can you unlock them all? There’s nothing more honourable than bragging about your score on Twitter, so there’s a button just for that! Move with the A (Left Arrow) and D (Right Arrow) keys. Jump by pressing W (Up Arrow) key, or by pressing the Space-bar. Attack by Left-Clicking (Z) or Right-Clicking (X) with your mouse. Each of the sides will use their respective weapons. Press the E (C) key to use your item. Pick Weapons Cards by Left-Clicking (Z) or Right-Clicking (X) with your mouse. 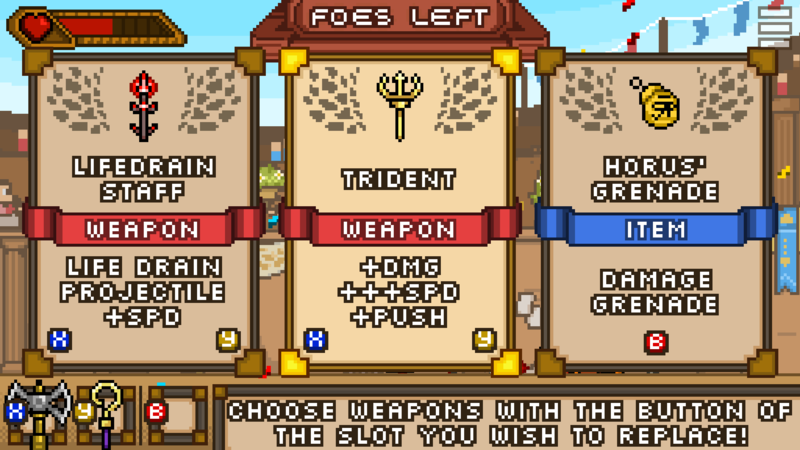 The card will replace the respective weapon. Pick Item Cards by Left-Clicking (C). The card will be placed on your item slot. Move with the Left Stick or with the D-Pad. Jump by pressing the A Button (Cross), pressing Up on the D-Pad, or by tilting the Left-Stick Up. Attack by pressing the X Button (Square) and Y (Triangle). 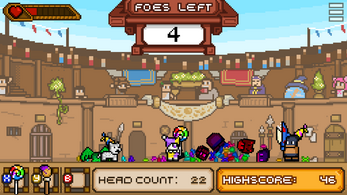 Each of the buttons will use their respective weapons. Press the B Button (Circle) to use your item. Pick Weapons Cards by pressing the X Button (Square) or the Y Button (Triangle). 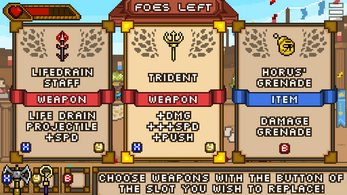 The card will replace the respective weapon. 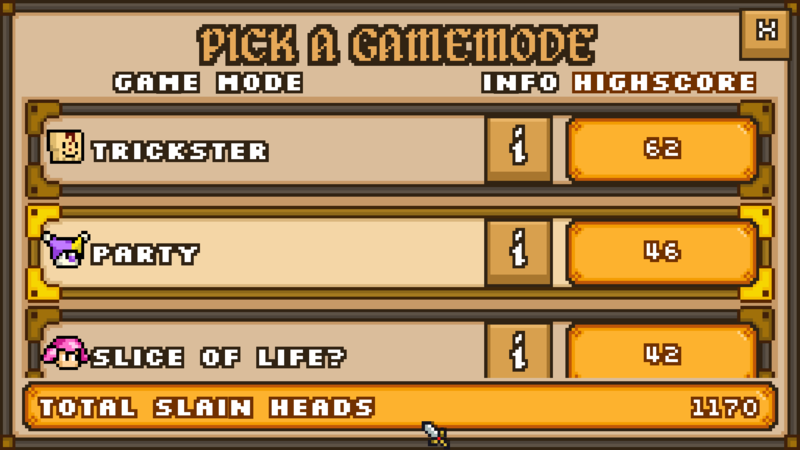 Pick Item Cards by pressing the B Button (Circle). The card will be placed on your item slot. Announcing Colossorama 1.3 - The Champions Update! Join the #playtesting arena of Colossorama 1.3!